Field visits are by far the best part about being a Kiva Fellow. You’re given the opportunity to hop on a motorbike, hike up a village trail, and actually see the impact of a Kiva loan firsthand. Five years ago, Ms. Rita took her first loan of NRs. 10,000 (USD $150) and purchased some extra seed and fertilizer in the hopes of expanding her small vegetable patch. 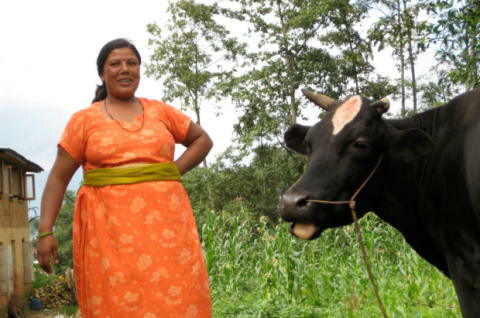 With the profits from this initial investment and a second loan from Patan Business and Professional Women (they offer a graduated loan program), she then purchased her first dairy cow. After hearing about a program that subsidized the installation of methane gas storage tanks, Ms. Rita took another loan and applied for the program. With this new system, she is now able to capture the valuable gas released from her cow’s waste in a simple controlled-release storage tank. Today she no longer purchases gas from the city and can even sell some during times of shortage. Ms. Rita exemplifies the potential of microfinance. A combination of access to capital and strategic investment has allowed her and her family to drastically improve their economic situation in a short five years. Great story, and exactly my hope for using capitalism to improve the standard of living for people around the globe. I notice a few days ago, for the first time, some of those seeking loans are about to have their listings expire unfunded. Kiva gives listings 30 days to be funded. Yesterday Kiva announced they were providing funds to lenders as soon as the entrepreneur has made a payment (it used to provide the funds to lenders only once the loan was closed out). My guess is they were smart to create a backlog of available loan options before flooding the Kiva market with lots of extra capital (I, for example, now have over $500 available to lend. If they didn’t have a backlog when this change took place they would have created a situation whee lenders could log in to lend money and can’t find anyone to lend to. I have no problem if some loans are not funded (I want to help entrepreneurs by providing funding to build a business – some loans are for things like adding a room onto their house, which is fine but not what I want to support with interest free loans from me). A significant number of the unfunded loans where for pubs (I think Kiva lenders might not have the same criteria as banks :-). If you haven’t loaned money through Kiva, please consider it now. If you do, send me your Kiva lender link and I will add it to Curious Cat Kivans. We have a couple readers that have provided links (including fellow bloggers Kevin Meyer and Tom Southworth) but I really would like to see more. This entry was posted in Economics, Respect and tagged Economics, entrepreneur, global, respect for people on August 30, 2008 by John Hunter. With plants in 27 countries, more new factories under construction and workers speaking languages that include Russian and Turkish, Toyota’s top executives are trying a difficult balancing act – replicating the company’s success and operating principles in other countries while ceding more control to these new outposts at the same time. Next year, it expects to sell more than 10.4 million cars worldwide, double what it sold in 2000. The videos show everything from the correct way to hold a screw to the best way to hold an air gun so that a worker’s hand will not tire in a few hours. This month, workers from Toyota’s plant in Thailand took part in training required for jobs in their plant’s paint shop. Listening as an interpreter translated from Japanese into Thai, the workers were shown how to bend their knees and spray a water gun across a clear panel of Plexiglas. Yet another article on the management of Toyota. And here is another: Toyota heir slowly following in family footsteps. And another: Toyota explores more efficient methods to build cars. This entry was posted in Lean thinking, Management, Management Articles, Toyota Production System (TPS) and tagged cars, global, Japan, Manufacturing, Toyota, Toyota Production System (TPS) on February 24, 2008 by John Hunter. Business Week has several good articles on the topic of China’s Economic impact including: Shaking up Trade Theory and The China Price. In Shaking up Trade Theory Aaron Bernstein explores: “The fact that programming, engineering, and other high-skilled jobs are jumping to places such as China and India seems to conflict head-on with the 200-year-old doctrine of comparative advantage.” Over the last few years the white collar job losses in tech US have seemed to cause quite a bit more concern than the manufacturing and other job losses of the 1980s and 1990s. His article does a good job of exploring this issue within the limits of a short magazine article. He captures the surprise economist (in the US) see because “Conversely, India, where just a fraction of its 400 million-plus workers have gone to college, should grab the low-skilled work and leave higher-end products to the U.S.” That conflicts with the data that many high skilled jobs are going to India (and elsewhere). The US Economists don’t seem to realize India is producing as many college educated engineers as the US. So India also has hundreds of millions of low skill workers that doesn’t mean they don’t also have plenty of high skilled worked (that speak English, which is, of course a huge benefit that is less true of Chinese high skilled workers). This entry was posted in Economics, Science and tagged China, Economics, engineering, global, India, USA on November 30, 2004 by John Hunter.